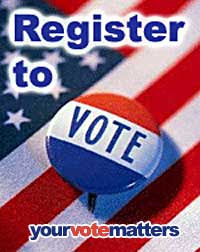 Help Hudson Democrats register 200 new voters before election day. It's getting down to the wire. There are only a few weeks left to register new voters. We will be fanning out throughout the city with a goal of 200 newly registered voters before the cut-off to register to vote in this years crucial election. Meet at the new Hudson Democrats Election Headquarters on Saturday or Sunday September 20th & 21st and 27th & 28th at 11:30 am. Election Headquarters is at 443 Warren Street.